‘Diabetes’ is a term used for describing a group of metabolic diseases typically characterized by high levels of blood glucose (blood sugar) over a prolonged period of time. 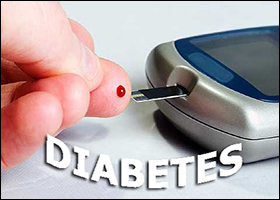 It is, hence, a long-term condition which is officially referred to as ‘Diabetes Mellitus’ (DM) by doctors. There are some effective Diabetes herbal remedies which can be very helpful in managing the ‘Diabetes’ group of diseases. People suffering from Diabetes have high blood sugar levels due to two main reasons: (i) inadequate production of insulin by the pancreas; and/or (ii) improper response by the body’s cells to the insulin produced by the pancreas. In the first case, in which the pancreas do not produce enough insulin, the patients are said to be suffering from Type I Diabetes; and in the second case, in which the cells of the body do not response properly to the insulin produced, the patients are said to be suffering from Type II Diabetes. Type I Diabetes was earlier known as ‘insulin-dependent diabetes mellitus’ or ‘juvenile diabetes,’; while Type II Diabetes is basically a condition marked by ‘insulin resistance.’ Type II Diabetes can gradually lead to a lack of insulin in the patients as the diseases progresses. Type I Diabetes and Type II Diabetes are the two main forms of Diabetes; with the former (Type I) accounting for nearly 10 percent of all Diabetes cases worldwide, and the latter (Type II) accounting for approximately 90 percent of the Diabetes cases worldwide. Besides Type I and Type II Diabetes, another type of Diabetes is ‘Gestational Diabetes’ which affects women during pregnancy. Due to high blood sugar levels, Diabetes patients experience some common signs of the disease which include frequent urination (polyuria), intense thirst (polydipsia) and intense hunger (polyphagia). In addition to these symptoms, Diabetes can also lead to unusual weight loss or weight gain, fatigue, male sexual dysfunction, difficulty in healing of cuts/bruises, numbness and a tingling sensation in hands and feet. For managing these symptoms, Diabetes herbal remedies can prove to be very beneficial for the patients. According to Ayurveda, Diabetes (Prameha) is a metabolic ‘Kapha’ type of disease, which is marked by elevated levels of blood sugar. Ayurvedic experts believe that diabetic disorders are chiefly caused by fat, urine, and the build-up of ‘Kapha’ resulting from intake of improper foods and liquids, as well as lifestyle and other factors. Ayurveda clearly mentions that Diabetes is a ‘Yapay’ disease, which means that the condition lingers on for the patients throughout their lifespan. However, the condition can be managed with the help of Diabetes herbal remedies, along with some advisable diet and lifestyle changes. Diabeta Plus capsules are one of the most effective Diabetes herbal remedies as these capsules are prepared from a combination of some very powerful herbs which synergistically have immense health benefits. The herbs which are combined for preparing these capsules include Gurmaar (Gymnema Sylvestre), Karela (Momordia Charentia), Vijaysaar (Pterocarpus marsupium), Tulsi (Ocimum sactum), Ashwagandha (Withania somnifera), and Saptarangi (Salacia oblonga). These capsules can be very beneficial for Diabetes patients because they are helpful in improving the capability of the pancreas to function properly, controlling the levels of blood sugar naturally, and bringing about a significant improvement in disordered blood sugar levels. Dosage of Diabeta Plus capsules recommended for Diabetes patients: Two capsules, twice a day, after meals. These capsules are prepared from the natural extract of the aromatic ‘Fenugreek’ herb (Trigonella foenum-graecum) which belongs to the ‘Fabaceae’ plant family, and is widely known for its immense medicinal value. Fenugreek is a commonly used ingredient in Indian dishes, and has proven capabilities to treat a number of health problems. The use of Fenugreek capsules is beneficial for Diabetes patients because these capsules can lower their high blood sugar levels, enhance the functioning ability of digestive system, aid digestion, prevent the formation of gas or flatus, and assist the pancreas in secreting more of the insulin hormone in order to reduce the risk of high blood sugar. Dosage of Fenugreek capsules recommended for Diabetes patients: Two capsules, two times a day, after meals. These capsules are prepared from the extract of Karela or Bittermelon (Momordia Charentia) which is considered an excellent Diabetes supplement in Asia due to its proven ability to manage the symptoms of the disease. Karela is, in fact, a remarkable Ayurvedic product for managing Diabetes. Karela capsules, when taken regularly by Diabetes patients, can help control the blood sugar levels, produce an action similar to that of insulin, and supplement essential chromium and other microminerals for restoring normal blood sugar levels. Dosage of Karela capsules recommended for Diabetes patients: Two capsules, two times daily, after meals. This churna is also one of the most beneficial Diabetes herbal remedies. It is an amazing herbal powder prepared from some well-known rejuvenating herbs. The herbs which are combined for preparing this churna include: Saptarangi (Salacia oblonga), Vijaysaar (Pterocarpus marsupium), Karela (Momordia Charentia), Gurmaar (Gymnema Sylvestre), Bilva Patra (Aegle marmelos), Neem Patra (Azardirachta indica), Methi (Trigonella foenum graceum), Jamun (Syzgium cumini), Babool (Acacia arabica), Tulsi (Ocimum sactum), and Sadabahar (Eochnera rosea). The churna is an excellent health tonic which can lower the blood sugar levels, strengthen the immune system, and provide ample nourishment to the body cells in order to heal the metabolic disorder. Dosage of Madhumehantak Churna recommended for Diabetes patients: 1-2 teaspoonfuls of the churna, with plain water, two times a day, after meals. The above-mentioned Diabetes herbal remedies are very helpful in managing the disease and lowering the high blood sugar levels. The regular use of these remedies, in recommended dosages, can work as a preventive measure against the potential long-term health complications which can result from Diabetes, such as cardiovascular disease, stroke, damage to the eyes, foot ulcers, and chronic kidney disease.